New releases have been a long time coming from French producer Ocoeur, who briefly popped up in 2010 to deliver a one-two, EP-LP combo. The initial releases struck as a little underdeveloped, but there was a lot of promise hidden in the emotional shards of glitch and downtempo: promise I was personally hoping to witness again soon after. It’s been longer than hoped, but this year Ocoeur has arrived for round 2 with a new record label and new, sleeker sound: last summer saw Light as a Feather flirt brilliantly with warm, ambient soundscapes whilst playing off orchestral swells with harsh, yet restrained glitch. Unique and playfully exciting, it was all of 2010’s promise blossoming to one outstanding album. Fast forward to December and this little three track EP arrives like an encore. Light as a Feather was excellent; Memento proves Ocoeur’s got plenty more to give. It’s then a bit odd to hear Memento begin closer to a funeral march than a victory lap. “Fusion” is hauntingly mournful: switching Ocoeur’s emotion dripped synths for a much colder tone. The track is lead by tentative violin notes scitting slowly over the dark hums, crackles and hushed piano. It’s all a tad foreboding, and more restrained than we’ve previously heard him. What’s more is it works -really well in fact- so it’s nice to see experimentation like this pay off. 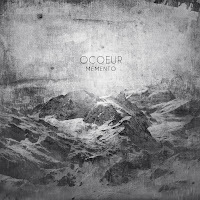 The other two original tracks on this EP stick much closer to Ocoeur’s original aesthetic. Heavy on the piano and with strong glitch undercurrents, they would feel right at home in Light as a Feather. The title track arguably offers much more to talk about: it’s a masterclass in how to elevate a simple melody with deliciously subtle and creative percussion. Those familiar with the IDM pallette will find a lot to love amongst the clicks and groans of this musical machine, but its the almost unnoticeable touches which show Ocoeur’s skill. Every repeat sounds a bit different as your mind latches on to different progressions - something pretty useful in a short EP. So despite the risk of becoming Light as a Feather’s afterthought, Memento moves with more than enough weight to stand its own ground. The two remixes of previous single “Light” are worth a look, too, if only a little uninteresting from a reviewing perspective. In any case, “Fusion” opens up the question of where Ocoeur will go next. Let’s just hope we won’t have to wait another three years to find out.